As usual at Virtual Telescope, each observing night we check the Transient Page at Central Bureau for Astronomical Telegrams, to see if there are new suspect transients waiting for optical and – possibly – spectroscopic confirmation. Last night we observed PSN J12243098+7532086, a possible supernova in NGC 4386, reported at mag. 16.0. 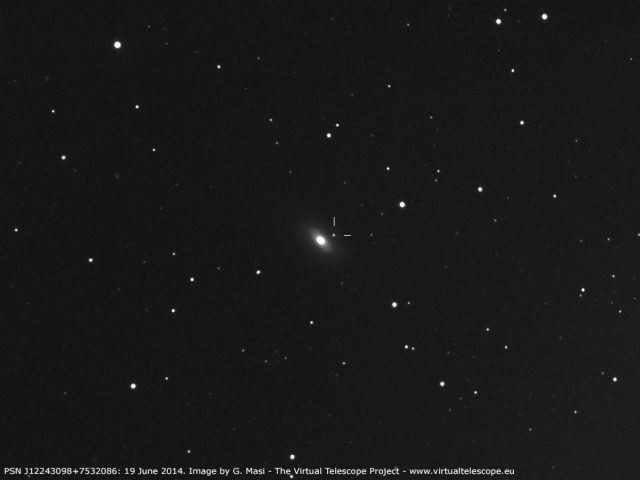 The 17″ robotic unit immediately confirmed this bright object on 120-seconds exposures, as shown in the image above, where the object was found at mag. 16.0 (R). Being the source bright, we managed to grab spectra, using our 14″ robotic unit. Below is the average of 12, 300-seconds images, taken using a 100 lines/mm grating, with a dispersion of 34.5 angstroms/pixel. 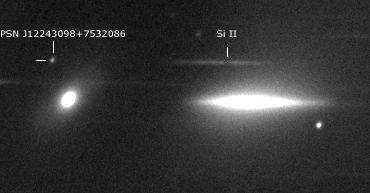 They were co-added and the resulting image shows Si II absorption around 6100 angstroms, suggesting this is a type Ia supernova. Assuming a recessional velocity of 1677 km/s for the host galaxy (NGC 4386, via NED), an expansion velocity of 12000 km/s is derived from the minimum of the Si II 6350-angstrom line. Plotting the spectrum from the image above, the Si II feature is much more apparent. The plot below is calibrated in wavelength, but nor corrected for instrumental response. I tried to get an image and spectrum with our CDK-17 and SA-200, but got clouded out before completion. 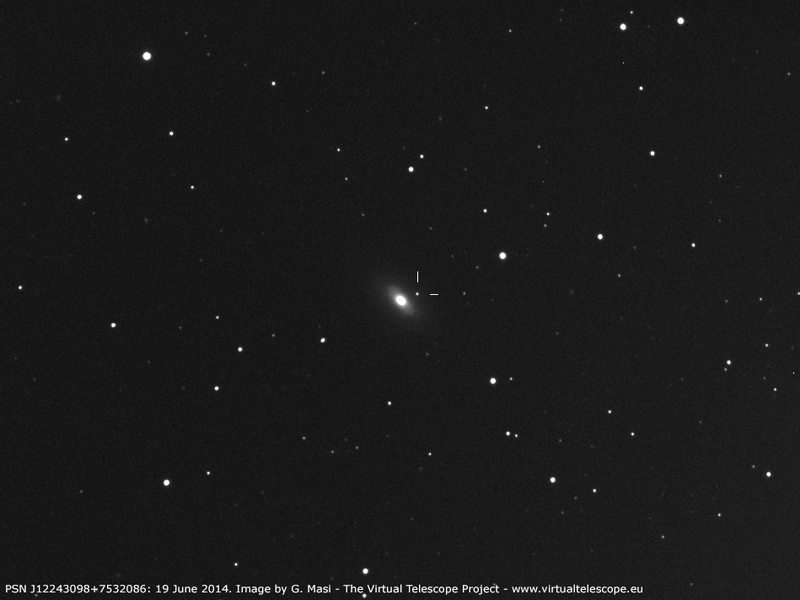 A preliminary 300 sec Lum image seemed to show the SN as a pretty bright object, but no photometry was done. Seemed a lot brighter than 16th mag. Need a clear sky to continue. thanks, Brad, for the report, will try to get new images in a couple of hours.